Bookmark this post! It will be updated as more events are announced. You can also get frequent updates via our Twitter. Have a suggestion? Email us. June 1 – 5 (various dates): the provincial government presents various events as part of Victims and Survivors of Crime Week in Canal Flats, New Westminster, Victoria, Skidegate, and Old Massett. See more details and contact info for each event here (PDF). June 4 – 6 (various dates): Courthouse Libraries BC and Access Pro Bono present two webinars for current and prospective volunteers with Access Pro Bono. Advocates and front-line workers are welcomed to join. Monday, June 4 (12:00 – 1:30 pm) Residential Tenancy Act Training. Register online here. Wednesday, June 6 (12:30 – 2:30 pm) Employment Standards Training. Register online here. June 4 – 28 (various dates): the provincial government’s Rental Housing Task Force is hosting public meetings in 10 locations across BC throughout June. The Task Force invites rental housing providers, renters, housing advocates, and stakeholders to attend a 3-hour facilitated workshop in their community. They are seeking input to identify solutions and ideas for making recommendations to modernize BC’s tenancy laws and policies. Find the location closest to you and register online here. Tuesday, June 5 (9:30 am – 12:30 pm): Community Legal Assistance Society (CLAS) presents Preventing, Investigating and Responding to Workplace Sexual Harassment at the CLAS office in Vancouver. This three-hour interactive workshop will help you understand your legal obligations to prevent, investigate and respond to sexual harassment in the workplace. The course is accredited for 3 hours of Continuing Professional Development credit by the Law Society of BC. Workshop fee is $100 per person. If you are a non-profit organization and the fee poses a barrier, please contact us to discuss alternative arrangements. Get more information here (PDF). 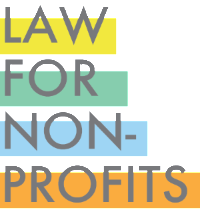 June 5 – 6 (various dates): Law for Nonprofits presents various workshops in Cranbrook and Vancouver. Tuesday, June 5 (10:00 am – 12:00 pm MDT) Recordkeeping and Privacy for Non-Profits – College of the Rockies, Cranbrook. 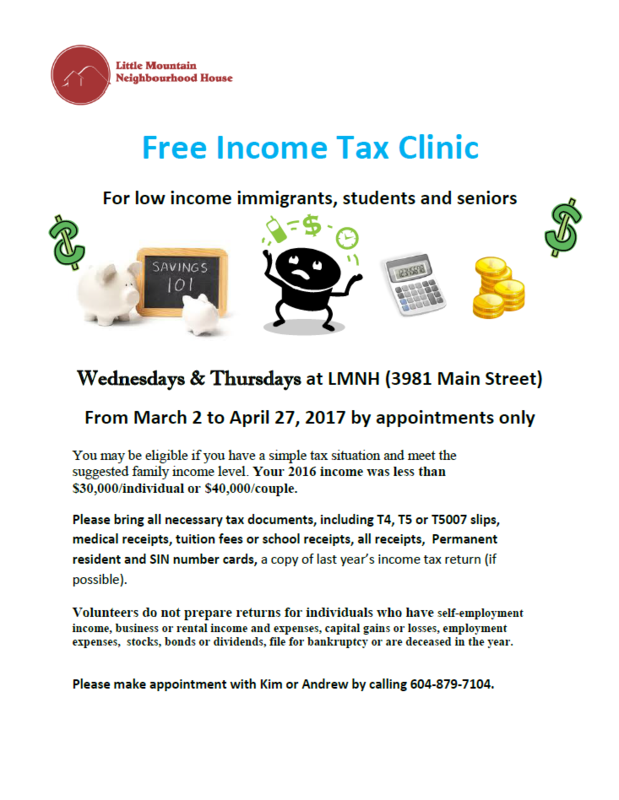 Free to non-profit organizations within the West Kootenay/Columbia Basin area. Get more information and register online here. Tuesday, June 5 (1:00 – 3:00 pm MDT) The New Societies Act: What You Need to Know – College of the Rockies, Cranbrook. Free to non-profit organizations within the West Kootenay/Columbia Basin area. Get more information and register online here. Wednesday, June 6 (9:30 am – 12:00 pm) The New Societies Act: What You Need to Know – the Alliance for Arts + Culture, Vancouver. The fee is $50. City of Vancouver Bursaries available. Get more information and register online here. Wednesday, June 6 (1:30 – 4:00 pm) Employment and Human Rights 101 Workshop – the Alliance for Arts + Culture, Vancouver. The fee is $50. City of Vancouver Bursaries available. Get more information and register online here. June 5 – 13 (various dates): Plan Institute presents information sessions and workshops by phone and in Vancouver. Tuesday, June 5 (10:00 am – 12:00 pm) Registered Disability Savings Plan (RDSP) – Plan Institute Office, Suite 260 – 3665 Kingsway, Vancouver. Cost: free. Register online here. Thursday, June 7 (10:00 am – 12:00 pm) Wills, Trusts and Estate Planning Workshop – Plan Institute Office, Suite 260 – 3665 Kingsway, Vancouver. Cost: $65.00 per person or $90.00 for two. Register online here. Wednesday, June 13 (10:00 am – 12:00 pm) Registered Disability Savings Plan (RDSP) – teleseminar by phone/computer. Cost: free. Register online here. June 6 – 7 (various dates): People’s Law School presents two classes on Wills and Estates for the public on the following topics in Burnaby and Port Moody. Wednesday, June 6 (7:00 pm – 8:30 pm) – Port Moody Library. Get more information here. Thursday, June 7 (7:00 pm – 8:30 pm) – Burnaby Public Library – McGill Branch. Get more information here. June 8 – 28 (various dates): MOSAIC presents various events and workshops in Burnaby, Vancouver, and Surrey. Friday, June 8 (10:00 am – 12:00 pm) Moving Ahead: How to Apply for Citizenship – MOSAIC Highgate, Burnaby. Saturday, June 9 (4:00 – 6:00 pm) Moving Ahead: PR Card Renewal and Citizenship (in Tigrinya) – MOSAIC Highgate, Burnaby. Thursday & Friday, June 14 – 15 (9:30 am – 12:30 pm) Two-Day Citizenship Preparation Workshop – MOSAIC Boundary, Vancouver. Mondays, June 18 and 25 (5:30 – 8:30 pm) Two-Day Citizenship Preparation Workshop (English with Mandarin support) – Tommy Douglas Library, Burnaby. Tuesday, June 19 and Wednesday, June 20 (10:00 am – 1:00 pm) Two-Day Citizenship Preparation Workshop – Collingwood Public Library, Vancouver. Saturday, June 23 (4:00 – 6:00 pm) Moving Ahead: PR Card Renewal and Citizenship (in Tigrinya) – MOSAIC Highgate, Burnaby. Wednesday & Thursday, June 27 – 28 (1:30 – 4:30 pm) Two-Day Citizenship Preparation Workshop (English with Hindi, Urdu and Punjabi Support) – MOSAIC Surrey. Tuesday, June 12 (5:00 – 9:00 pm): the Kettle Society presents 2018 Making a Difference Fundraiser at The Permanent, Vancouver. Come to celebrate The Kettle Society’s inspired mental health work at an evening to benefit our core service programs. Taking place at The Permanent, one of Vancouver’s most stunning heritage spaces, each guest will enjoy a complimentary themed cocktail and delicious food from The Lazy Gourmet. Cocktails and conversation will lead to a performance by The Kettle Choir, and our keynote speaker Lieutenant-General, the Honourable Roméo Dallaire (Ret’d) speaking on Mental Health and Invisible Wounds. Get your tickets here. June 12 – 20 (various dates): Seniors First BC presents Frauds and Scams Workshops in Coquitlam and Port Moody. Tuesday, June 12 (2:00 – 3:30 pm) Port Moody Library. Get more information here. Wednesday, June 20 (6:30 – 8 pm) Glen Pine Pavilion, Coquitlam. Get more information here. Thursday, June 14 (3:00 – 6:00 pm): Society of Children and Youth of BC presents an Open House at 1720 Grant Street, Vancouver. Please join us in our new space at 1720 Grant Street to meet our staff and learn about our programs. RSVP info@scyofbc.org. Saturday, June 16 (2:00 – 5:00 pm): Kinbrace Community Society presents Celebrate 20 at 1820 Venables Street, Vancouver. Celebrate 20 years of welcome, belonging, and opportunity that is Kinbrace Community Society (1998 – 2018). Get more information and register online here. Tuesday, June 19 (6:00 – 7:30 pm): BC Freedom of Information and Privacy Association (FIPA) presents 2018 Annual General Meeting at the YWCA Hotel, Vancouver. Join FIPA staff, board, members, and others in the information and privacy community at FIPA’s 2018 Annual General Meeting. The event will feature a talk by Vincent Gogolek who will be reflecting on his time with BC FIPA. Get more information here. To register, send an email to fipa@fipa.bc.ca with your name, email, phone number, and membership status. Wednesday, June 20 (5:45 – 7:00 pm): YWCA Vancouver presents 2018 AGM & Tuning In: Examining Trends on Millennials, Masculinity and Gender Equality at UBC Robson Square, Vancouver. Please join us for YWCA Metro Vancouver’s Annual General Meeting. We are excited to welcome Shachi Kurl, Executive Director of the Angus Reid Institute, to deliver a keynote that will examine trends on millennials, masculinity and gender equality. Get more information and register online here. Friday, June 29 (12:30 – 2:00 pm): Disability Alliance BC presents Snack & Chat: Filing Income Taxes – Tips and Benefits at #204 – 456 West Broadway, Vancouver. Come to DABC’s 3rd Snack and Chat, and learn about income tax filing and the benefits of filing your income taxes. To register, please contact Val at 604-875-0188 or feedback@disabilityalliancebc.org. Lunch will be provided. Get more information here. 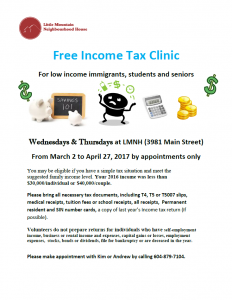 These clinics are offered to low income immigrants, students and seniors. You may be eligible if you have a simple tax situation and meet the suggested family income level. Your 2016 income was less than $30,000/individual or $40,000/couple. See poster for details. Please make appointment with Kim or Andrew by calling 604-879-7104. Friday, March 10 (7:00-9:00am): West Coast LEAF presents the 2017 Equality Breakfast at the Fairmont Hotel Vancouver. 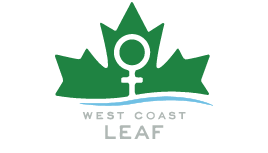 Celebrate West Coast LEAF and International Women’s Day at the best event this side of noon! Keynote speaker: Dr. Cindy Blackstock is Executive Director of the First Nations Child and Family Caring Society of Canada and a professor in the School of Social Work at McGill University. A member of the Gitksan First Nation, Cindy has 25 years of social work experience in child protection and Indigenous children’s rights. Get tickets online. Sales end March 7. Monday, March 6 (1:00-2:30pm) Richmond Public Library – 7700 Minoru Gate: Power of Attorney (Cantonese) – Contact 604-231-6413 or click here to register. Monday, March 6 (7:00-8:30pm) Burnaby Public Library – 4595 Albert Street: Wills & Estates – Contact 604-299-8955 or click here to register. Monday, March 6 (7:00-8:30pm) Burnaby Public Library – 6100 Willingdon Ave: Criminal Law – Steps Involved in a Criminal Case – Contact 604-436-5400 or click here to register. Wednesday, March 8 (7:00-8:30pm) Burnaby Public Library – 7311 Kingsway: Bullying Between Older Adults in Social Spaces – Contact 604-522-3971 or click here to register. Monday, March 13 (1:00-2:30pm) Richmond Public Library – 7700 Minoru Gate: Last Will and Testament (Cantonese) – Contact 604-231-6413 or click here to register. Wednesday, March 15 (9:30-12pm): Pacific Legal Education Outreach Society (PLEO) presents The New Societies Act: What You Need to Know, at 100-938 Howe Street in Vancouver. The BC Society Act, which provides the rules for governance and incorporation of non-profits, officially proclaimed important changes on November 28, 2016. There will be a two year transition period by which time all societies in BC will have to make the switch to the new Act. This workshop will provide the information on the bylaw and policy changes necessary for your organization to effectively make the transition when the new Act is proclaimed. Register Online. Tickets are $50. 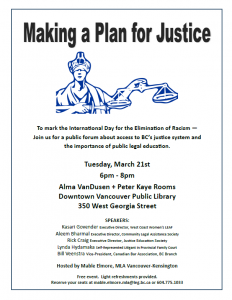 Tuesday, March 21 (6:00-8:00pm): At the Downtown Vancouver Public Library (Alma VanDusen & Peter Kaye Rooms), join a public forum on Making a Plan for Justice. 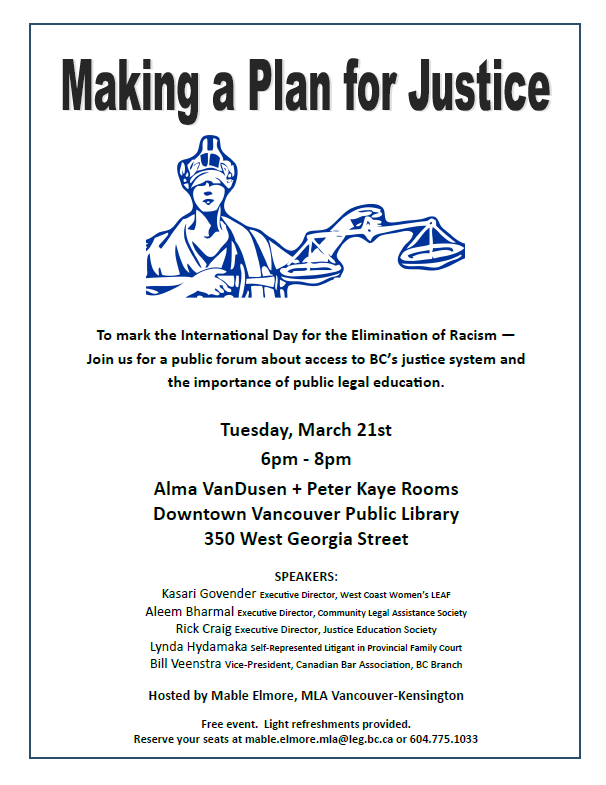 To mark the International Day for the Elimination of Racism – Join us for a public forum about access to BC’s justice system and the importance of public legal education. Speakers include: Kasari Govender, Executive Director, West Coast LEAF / Aleem Bharmal, Executive Director, Community Legal Assistance Society / Rick Craig, Executive Director, Justice Education Society / Lynda Hydamaka, Self-Represented Litigant in Provincial Family Court / Bill Veenstra, Vice-President, Canadian Bar Association, BC Branch. Free Event. Light refreshments provided. Reserve your seats at mable.elmore.mla@leg.bc.ca or 604.775.1033. 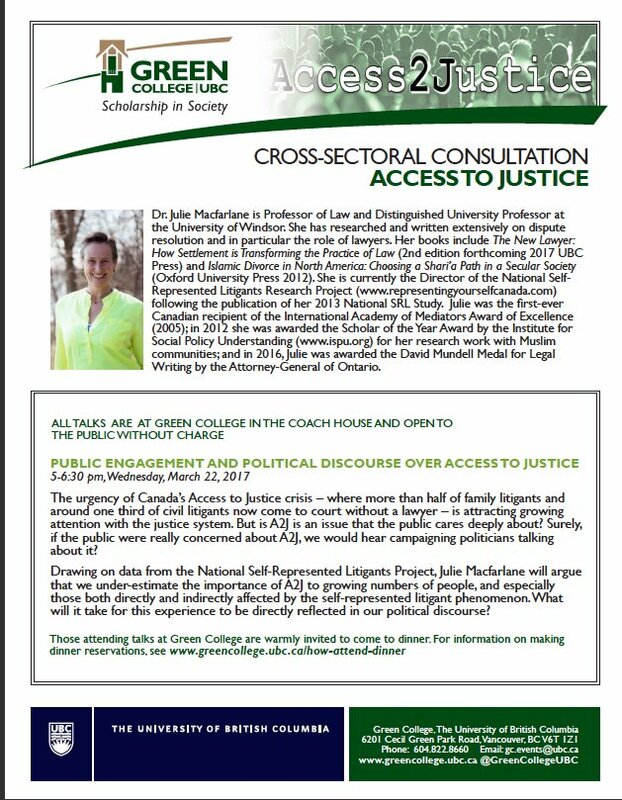 Wednesday, March 22 (5-6:30pm): Join Public Engagement and Political Discourse Over Access to Justice at 6201 Cecil Green Park Road, Coach House, Vancouver. The urgency of Canada’s Access to Justice crisis – where more than half of family litigants and around one third of civil litigants now come to court without a lawyer – is attracting growing attention with the justice system. But is A2J is an issue that the public cares deeply about? Surely, if the public were really concerned about A2J, we would hear campaigning politicians talking about it? 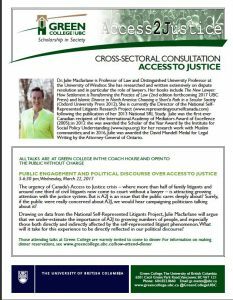 Drawing on data from the National Self-Represented Litigants Project, Julie Macfarlane will argue that we under-estimate the importance of A2J to growing numbers of people, and especially those both directly and indirectly affected by the self-represented litigant phenomenon. What will it take for this experience to be directly reflected in our political discourse? Free to attend. No registration required. Passed in 2010, Canada’s Anti-Spam Legislation (CASL) is developed to help Canadian individuals, businesses and organizations deal with spam and other electronic threats. CASL limits online commercial messages and prohibits unwanted downloads of programs. All Canadian organizations must comply with the Act, including nonprofits, charities, and libraries. 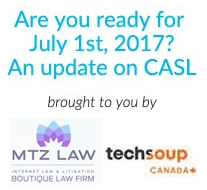 On March 22nd, Maanit Zemel, Principal and Founder of MTZ Law (www.casllaw.ca), will walk nonprofits through the Canadian Anti-Spam Legislation (CASL) for Non-Profits and Charities, and the next deadline for CASL that will come into effect on July 1st, 2017.